At 1658hrs on Friday November 21, the MVA assignment was transmitted for the tractor trailer that crossed the median in the vicinity of mm211 southbound. Harford Fire and EMS along with the Rescue were dispatched. While enroute, communications advised PSP was on location with a tractor trailer over the embankment with one pinned by the dash. The next due heavy, Rescue 7, along with a heavy wrecker from Kozlowski’s was requested. Chief 18-3 marked on scene confirming PSP’s report also advising the crash would be in 18’s first due and requested the run card be filled out accordingly. On Sunday November 16, at approximately 2030hrs, the MVA assignment was transmitted for SR106 near the carnival grounds for a vehicle into the trees and possibly pond with entrapment. Lt18a marked on scene confirming entrapment and began EMS care. Chief 18 marked on scene reporting one SUV into the trees with heavy entrapment and requested a full deployment off the rescue upon its arrival. The rescue marked on scene going to work forcing the driver’s door, removing the rear door and “B” post for the wide body. Due to the location of the vehicle and trees, a second crew began efforts to prepare for the dash lift if necessary. Friday morning October 24, started out around 0900hrs with a traffic control assist to PSP. Chief 24a responded to the location with nothing found. Upon further investigation, the incident was found at the intersection of SR2023 and SR247 – a hydraulic oil spill that stretched about 3 miles. R18 was added to the run for additional resources. While operating at the spill, the MVA assignment was transmitted for a rollover on the “I” at 206 southbound. Susquehanna County communications advised they were receiving multiple reports on the incident. This section of interstate was very quiet over the summer due to construction – the construction’s gone and so is the quiet. On the assignment: R18, E24, 18-9 and 24-9. R18 cleared the initial run and headed for the interstate. On Thursday Oct 23, the 24 box was transmitted for a working fire at 126 Decker Rd, Greenfield Township. E24 marked on scene with Chief 24 reporting a 2 ½ story wood frame residential with a smoke condition at the eaves. E24 along with a crew from E36 stretched an 1 ¾ to the A/D corner for the initial knock. L18 set up at the A/B corner and sent the main ladder to the roof as a precaution. Interior crews checked for extension, ventilated with a PPV and opened up where necessary. Crews cleared in less than one hour. Chief 24A had the “Decker Rd” command. On Monday, October 20, the 1801 box was transmitted for a working barn fire on Rt 106 in the Village of Royal. Chief 18-1 reported he was responding and received updated information on the dispatch that this would be a confirmed barn fire with extension into the brush/woods. A second alarm was requested. 18-1 marked on scene with two structures fully involved and approx 4-5 acres of heavy brush burning. Additional brush units were requested. L18 and E24 arrived together with E24 laying out approximately 900’ of LDH and hit the structures with their deck gun. L18 was assigned to the front of the residence for protection and to stop the advance of the brush fire before it moved into a heavily wooded area. As units arrived, they went to work controlling and extinguishing both fires. On Sunday, October 19, the crew from 18 finished the 16 hour truck company operations class with a full day of practical skills. Crews from Carbondale City, Jermyn, Clifford, Waymart were under the direction of Captain Larry Semenza from area 93. On Thursday October 16, crews from Clifford, Harford and Hop Bottom spent the day at Mt View Elementary School for Fire Prevention. 18 sent crews for the Rescue, Ladder and 18-9 and had a great day with the Kids. There are a variety of programs administered during the day depending on the age. 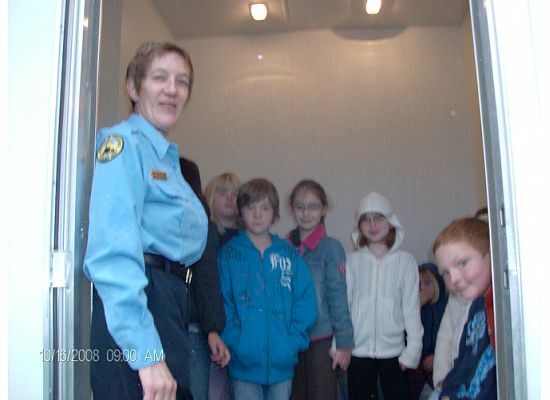 Some are given walk-arounds of the fire apparatus and ambulances, some take part in a presentation in the gym, while others are sent thru a Children’s safety trailer that offers an array of situations a child may be involved in at home such as tornado’s and fires. This year Michael Zeshonski and David Krizauskas headed the fire prevention for Clifford – an excellent job by both! This year marked the return of a fire safety trailer. A special thanks to Deby Kominsky, Chief Pratt, and all of Honesdale Fire Department for making this possible. On Thursday September 11, Ladder 18 and crew headed to South Montrose to honor and remember all those lost seven years ago. Ladder 18 along with Ladder 2 from Meshoppen, Wyoming County, held the American flag above the entrance to service. The steady pace of EMS, Fire and Rescue runs has continued into this week with multiple runs keeping the crew at 18 busy. 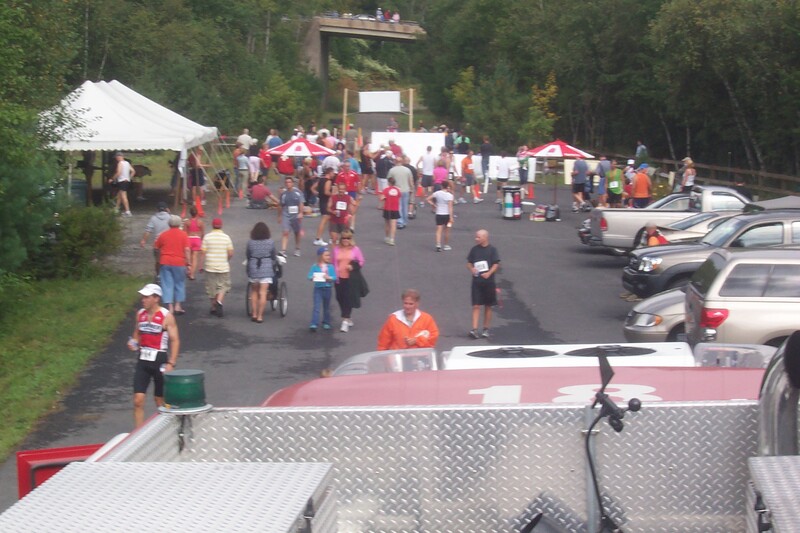 On Sunday, September 7, 18 rescue and EMS assisted the Northeast Rails-to-trails group with their first distance run. The event ran from Forest City, thru Clifford Township, Uniondale Borough and Herrick Township then returning on the same route. A very large portion of the run went thru 18’s first due, which was supported by a very good crew from 18. Along with 18-9, the Jitney (Teryx), two PATV’s, and the Rescue, crews from FCEMS, Uniondale Fire, 28 EMS and 51 EMS were on the detail. Crews from Clifford staged along the course with Capt 18 establishing a med station at the midway point. 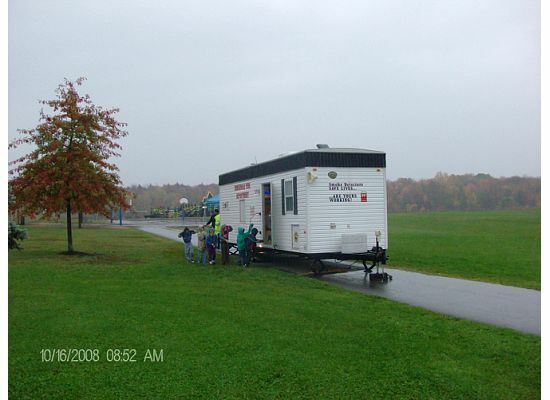 18-9 Staged at 171 and Upper Stillwater Road while the Rescue served as the race Command Post at the start finish line. EMS was quiet with no transports required; however, during the race 18-9 ran a medical on SR2027 and assisted 28 with a two car MVA on Rt 171. After a very busy weekend at 18, the MVA was dispatched on Tuesday morning at 0745hrs for the one car crash at 206.2 southbound, car over the embankment. On the assignment: R18, E24, 18-9, 24-9 and ALS. Chief 18 requested any updated information due to the high-hazards of the immediate area. County advised they had confirming reports of a rollover with one still in the vehicle. Lt18b arrived at the 206 with one vehicle on its wheels with no injuries and one vehicle over the bridge, on its roof near Rt374 with one occupant still in the vehicle. At 0243 hours on Sunday August 17, Susquehanna County Communications dispatched the 1802 box for a structure fire in the Lenoxville area with the cell call being disconnected. On the assignment: E24, HE4, R18, R36, R59, L18, T24, HT3, T36 , 18-9 and 24-9. While responding, Communications updated the location to Robinson Road off SR2021. Chief 18-3 marked on scene with a single story residential with heavy involvement in a substantial section of the structure requesting additional companies into the scene. L18 arrived and placed the 2 ½” attack line in service while additional crew threw ladders and began opening up. E24 arrived placing in service an additional line along with supplying L18. As crews arrived additional lines were deployed to suppress the stubborn blaze which had a strong hold on the structure. The second alarm was filled out a short time into the incident. HE4 established a tanker fill site and all water was supplied by a tanker operation. R18 served as the command post and 18-9 under the direction of Captain 18 handled rehab. Multiple crews worked through an extensive overhaul project prior to clearing around. 0700. PSP Fire Marshall was conducting the investigation. On Thursday evening August 14, the Ladder and Rescue crewed up and headed to Harford to take part in a drill at the Harford Village Apartments. The three story structure is one of Harford’s target boxes within their district. Harford, Hop Bottom, Clifford and New Milford Participated in the exercise. On Wednesday March 26, as the crew from L18 was returning from training, the 21 Box was dispatched at approx 2300hrs for a commercial structure on the Eynon-Jermyn Road, Lackawanna County. Communications advised the 21 Chief of multiple reports. Crews from the first alarm arrived to find a heavily involved two story commercial structure. 21 Command requested additional units into the scene with a defensive attack mounted. Due to water supply issues in the area, multiple tankers were called in for the shuttle –Tanker 18 responded on the special call. With L58 and L20 committed, L18 was placed on standby for the Up-Valley. The tanker returned near 0300 with the Ladder being placed back in service shortly after. At approximately 0710hrs on Monday, March 10, the 1804 box was transmitted for a working fire in a mobile home on Round Pond Road, Lenox Township. On the assignment: E24, HE4, NE1, L18, R18, R36, T18, T24, HT3, NT, 189 and HAM2. 18-20 marked on scene reporting a fully involved mobile home, flames venting from side B. With the report, one additional tanker was added. Chief 18-1 marked on scene confirming the report and requesting the ladder to put the 200' 2 1/2" in service upon arrival with the next due tying into the ladder for water. 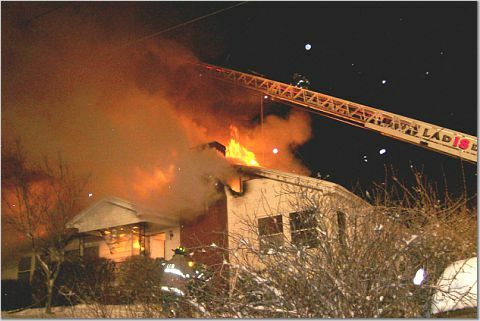 At 0152hrs on Saturday, February 23, 2008, the 1805 box was transmitted for an attic fire on Rt247, Clifford Township. On the run: E24, E41, E52, L18, R18, T18, T24, T52, 18-9 and 24-9. 18-10 (Fortuner) marked on scene quickly reporting the working residential with a fully involved attic. Chief 18 requested the sector RIT and two additional tankers bringing L43, T28 and T36. Chief 182 arrived establishing the 247 command confirming reports and requesting E41 make the lay to the dry hydrant at Crystal Lake. L18 arrived taking side D in the driveway with T24 right behind establishing the initial water. The crews from the first alarm placed (2) 1 ¾” and a 2 ½” attack line in service in division one immediately upon arrival and mounted an aggressive interior attack. Crews found light to moderate smoke on division 1 with a fire storm above in the attic. One line was advanced into the attic while crews pulled ceilings and attacked from below. The challenge was multiple attic spaces in the sprawling ranch. A second alarm was transmitted with the work ahead. Once the ladder pipe was shutdown, crews regrouped and headed in for the enormous overhaul. Captain 43 handled the division one overhaul operations. Over 2500’ of LDH was laid to complete the supply with HE4 relaying in the middle. Two additional water supplies were established by R36 and E281. Crews worked for an additional four hours to overhaul the residence. A special thanks to the move-up companies SQ22 and E60 for coming in and assisting packing up. Captain 18 established two rehab areas to keep a check on the crews. The last units cleared at 0740hrs. It is with the great sadness, our family at Station 18 said a final goodbye to Life-member Jack Tellep. Jack passed away December 31 after a brief illness. We offer Jack’s wife Connie our most heart felt condolences and support during this time. Jack held offices in administration and Line Officer duties creating a benchmark of what true dedication is. Jack was a true example of a great person. We'd like to take this opportunity to thank all who helped us and Jack's family during this difficult time. Particularly we would like to acknowledge the support received from Greenfield Township Volunteer Fire Company and Crystal Fire Company for their help with the funeral service. While we remained focused on saying goodbye to Jack, our station was filled with apparatus from Harford Fire Company, Forest City FD and Browndale Fire Company. Finally, thanks to all the members of Clifford Township VFC and Ladies Auxilary for all the sacrifices made this week. Again thank you to all. Photolink. On Monday February 11, at 2031hrs, the 1806 Box was transmitted for a structure fire on SR2033 Clifford Townhip. On the assignment: E24,HE4, E52, L18, R18, T18, T24, T52, 18-9 and 24-9. Chief 18-1 marked on scene establishing the 2033 command with smoke pushing from around the chimney and no access to the area. L18 arrived taking the A/B corner of the building, splitting crews with one crew heading to division 1 interior to open up and the second crew laddering the structure. E52's crew stretched a line from L18 while Chief 18-3 set the main ladder for roof operations. E24 headed for a water source approx one mile away planning for the tanker shuttle. R36 would arrive and handle the RIT assignment. On Saturday December 22 at 0109hrs L18, R18, and the tanker were special called to a first alarm structure box in area 28. E28, E52,and E41 were operating on a two story residential with heavy smoke showing and fire in the rear. The Ladder arrived on scene as the first due truck and positioned at the A/B corner with the assignment of opening up the roof. The crew vented the main roof of the structure and then went to work with the crew from 41 on a division 1 flat roof on side C of the structure.